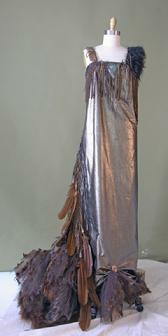 A gown of metallic bronze leather with ruching of taffeta, tuelling, and hand twisted deer leather fringe. 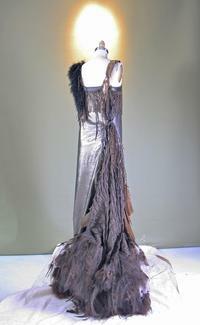 Copper icon of buffalo on bodice neckline, Tibetan lamb strap and copper strap adorned with many surprises of feathers, coins, and the rustling of fabric make this gown an experience to wear. 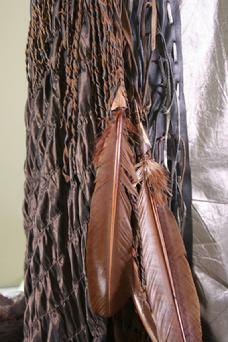 Silk lined, styled as a simple loose tunic caught up in the West.